The St Gall Priscian is a manuscript of 240 pages containing Priscian's encyclopaedic Latin grammar, completed at Constantinople c. ad 527. The text was known in Ireland possibly already in the following century. 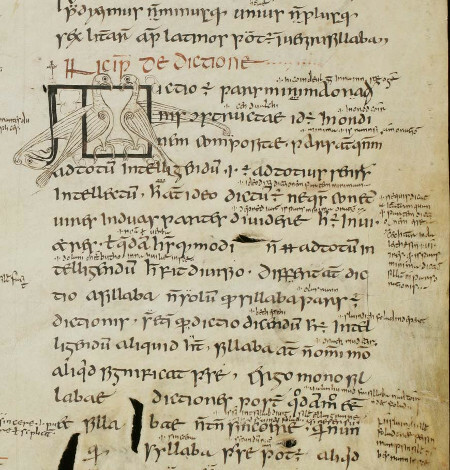 The manuscript now catalogued as ms 904 in the St Gall Stiftsbibliothek was written by Irish scribes in 850–1, probably in Ireland, from where it was brought to the Continent between 855 and 863, reaching St Gall sometime after 888. The manuscript contains over 9,400 interlinear and marginal glosses, in addition to c. 3,000 symbol glosses (symbols to aid reading). About one-third of the verbal glosses are written in Old Irish, and these constitute one of our earliest sources for the language. This digital edition provides access to the text of the glosses and that of Priscian, along with links to images of the manuscript and previous editions, and linguistic information on the Old Irish glosses. 2: De syllaba, de dictione, de oratione, de nomine, etc.